I love creating transformational experiences for people. Come hang with me at any of the upcoming events around the world! Come take a class with me at Kundalini Yoga by the Sea in Santa Monica, CA on Wednesday, February 27 and March 6 at 12:45pm. Start the New Year off with a healthy mind, body, and spirit that are all joined in divine alignment. Relieve stress, depression, anxiety, and gain access to your own intuitive skills. Side effects may include: a deep purification of the mind, body, and spirit, and profound true happiness. This 8-week series is purposefully set up with a no refund policy so that you are serious in holding yourself accountable to show up for the classes!! Do a drop in for only $20 per class and pay in person via cash or credit/debit card. Since this is a home studio, address is shared only after registration. We are all carrying the energetics of our ancestors around with us everyday. Some of these are absolutely lovely and worth cherishing, of course. And some of those are old, outdated, unhealthy programs that are now unfortunately living in our own subconsciouses and ruling our lives in ways that don’t really have anything to do with us. These will most often show up in how we deal with our intimate relationships, our self judgments, our judgments of society, our thoughts on money and success. Unexplainable issues and recurring patterns will start to surface that have simply been programmed into us, but are not even ours. For example, ever been in a relationship where you feel like the other person is inevitably going to abandon or betray you, but they’ve never actually given you any real reason to believe that? Or what about the belief that you need to always scrimp and save and worry when it comes to money but you actually make plenty of money? It is very possible that these are traumas that your ancestors experienced, and they have been energetically and psychologically passed down to you. In this special 3-hour workshop, we will use spiritual psychology and ancient yogic meditation technologies to clean out and clear some of those unhealthy ancestral programs, and replace them with healthier ones that are in alignment with you. Join us at a picturesque retreat space overlooking the Santa Monica Mountains in gorgeous Topanga, CA. Early bird rate of $35 then price goes up to $45. Limited to a maximum of 8 participants. *Address shared after registration. No more space available for this event! In the ancient yogic cultures, over 4000 years ago, they discovered how you can actually release more feel-good chemicals within your body, creating a very real and powerful experience of Love within the body, heart, and soul. Come and learn how these ancient cultures worked their magic to elevate themselves into their highest selves, connecting to the cosmos while embodying the human body. The Yogic Science of Love is a profound and heart-opening event where the focus is on YOU. Join us in sacred space and community as we celebrate the lunar eclipse. This special evening will consist of astrology, kundalini yoga and meditation, live music, and yoga nidra, allowing us to fully receive the full transmission of this powerful supermoon in Leo. Let's supercharge this already invigorating time by amplifying our connection with the universal bodies around us and within in us. This workshop focuses on how to move past your blocks, fears, and resistance, and is specifically designed for those who have a clear vision of what they want but need help moving the blocks out of the way. These special teachings and meditation will literally help you to 'clear the path' towards your destiny. I love the energy of New Year’s Day. It’s all about looking forward to amazing possibilities and feeling excited about what is coming! In this special class, we will be setting our intentions for the upcoming year and anchoring those in with a great yoga set followed by a powerful meditation, and super loving relaxation. Inner Wealth = Outer Wealth: Are you embodying your true value? The focus of this special 3-hour intensive is for you to re-align yourself with a true sense of value, both inside and out. Changing your relationship with your inner wealth will change your relationship with your outer wealth. This powerful workshop will use three different methodologies to create a very real and tangible shift in your life: spiritual psychology skills, ancient yogic technologies, and profound meditation. Please only sign up here if you are supposed to be part of this private birthday celebration. You are SOVEREIGN! Any thoughts that you are less than worthy are nonsense. We will be making crystal crowns, doing some powerful meditations to claim our sovereignty, and we'll end with a crowning ceremony, all in celebration of RosaLinda! A special yoga, meditation, and spiritual psychology workshop focused on clearing the blocks to your dreams. Oftentimes, the things we think are preventing us from doing what we want are not the true culprits. Most people self-sobatage themselves on a regular basis. This powerful 3-hour workshop will use spiritual psychology, and ancient kundalini yoga + meditation techniques to help clear what's truly holding you back, creating a space of infinite creative possibility within you so you can move forward towards your dreams. You are SOVEREIGN! Any thoughts that you are less than worthy are nonsense. 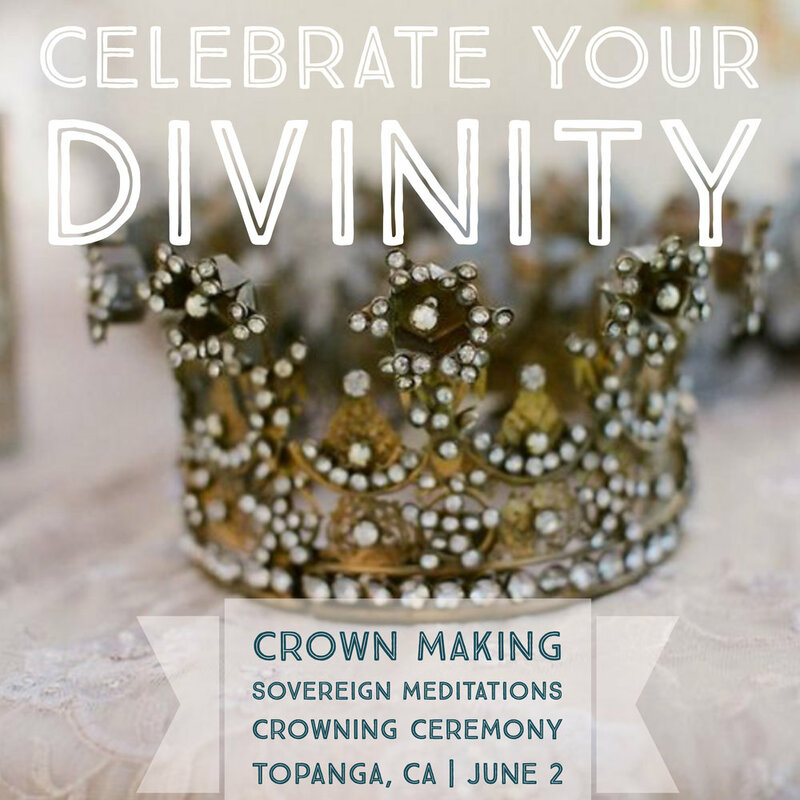 We will be making our own crowns (with a variety of materials), doing some powerful meditations to claim our sovereignty, and we'll end with a crowning ceremony. There's not much better than being on a beach on a tropical paradise island - except maybe doing meditation and yoga as part of a wedding and Celebration of Love while on said magical beach. Ah, the Seychelles Islands!!! So excited to be hosting a private session for a group of wedding guests on one of the most beautiful places on the entire planet. Do a deep dive into Self Love with immersive Spiritual Psychology Practices, Kundalini Yogic Science + Meditation, and Ayurvedic Superfoods in a magical private retreat in the Santa Monica Mountains in Topanga, CA. Space is limited. Olivia's Universe in a newsletter. I want some of Olivia's random sparkly thoughts on personal development, spirituality, and authenticity emailed to me. You signed up for my newsletter! Yay! I'm excited to be on this journey with you. I wrote this on Facebook 3 years ago. How powerfully poetic for it to show up today in the midst of more deep inner journeys. 🙏🏼 Time is not linear, people. So grateful my wonderful partner was willing to look after Mika yesterday so I was able to go to @satnamfestival and do an awesome set with the ever-youthful @krishnakaur Left feeling so rejuvenated!